Let me preface this fieldtrip report with a simple declaration. “I am not a beer writer, a beer judge, or a brewer. I simply work for a beer magazine and enjoy the side benefit of visiting breweries and attending beer fests immensely.” I recently returned from attending the World Beer Fest and thought I’d share the experience with fellow beer lovers in the Real Beer community. There’s only one thing I like more than a Carolina pulled pork BBQ sandwich, that’s a fine beer to enrich the experience. 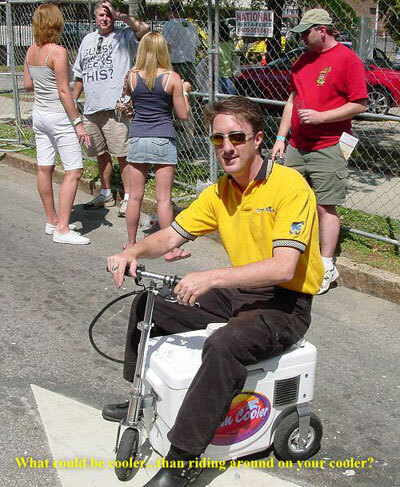 So my attendance at the bi-annual World Beer Fest in Raleigh, NC was as close to a nirvanic experience as this son of the south has ever gotten. The day was picture perfect in North Carolina’s capital city. Though the weatherman had been forecasting doom and gloom all week, the predicted storms never materialized and perfect spring weather rewarded the thousands of beer enthusiasts who attended the sold out event. The festival was held downtown in Moore Square, a short walk from the capital building. The park was large enough to give everyone plenty of space to spread out and relax, unlike some fests I’ve been to where sitting in the grass to enjoy a beer puts you in serious danger of being trampled by other attendees. 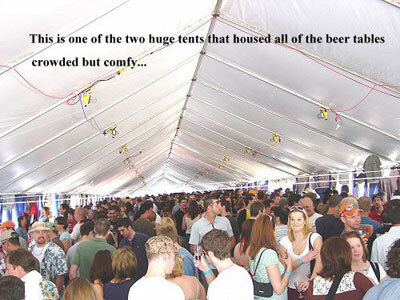 The first thing I had to do upon entering the fest was decide which of the two huge tents sheltering the beer stations I’d visit first. With over 400 beers to choose from and only 4 hours to act on my selections I didn’t make the choice lightly. Fortunately I found Flying Saucer had created eight flight lists that took the pressure off. Hop Heads Delight – The festivals bitterest beers. Brews from Belgium – Belgian originals and American interpretations. Classic British Ales – Beers that were the inspiration for the American craft brew revolution. Culture Clash – Original European styles and American interpretations. You Put What In My Beer? – There’s more to beer than barley, hops, yeast, and water. I admit I felt a bit ambitious when I checked Tar Heel Beers, Not Afraid of the Dark, and You Put What in My Beer?. I took a deep breath, unsheathed my festival glass, closed my eyes and threw myself into the crush of humanity. It wasn’t too bad. The lines were seldom longer than 3 or 4 at any of the stations I went to as I sampled and checked off beer after beer. I admit, my palette was a bit jaded, I live in Oregon and I’d just attended the Craft Brewers Conference in Austin, Texas the week before. That combination can make it a daunting task to find something really new and interesting. I was working my way thru the Tarheel beers which, though they were all well-built microbrews, didn’t really stand out for me, when a tall, flush-faced man broke from the crowd in front of me. I was at station 6, cleansing my palette with a sample of Rare Vos by Brewery Ommegang when he appeared and muscled his way thru the sea of happy beer drinkers. He squeezed by me and grabbed the arm of the young man directly behind me. “You have to try the Clipper City Loose Cannon Hop3 Ale!” he shouted over the din. “Yeah I’ll work my way over there!” the young man shouted back. “It’ll be gone! There’s a line and and and … it’ll be all gone dude!” the tall man said dragging his friend away. That sounded like a beer worth sampling to me so I leapt into action. Struggling against the tide I went for the nearest exit, burst from the East Martin St. beer tent, quickly consulted my station map, then ran (yes I said RAN) around the outside of the tent and dove into the crowd clogging the South Person St. beer tent entrance and worked my way to the Clipper City Brewery station. Compared to other stations there was a pretty good line. A dozen people waited in front of the popular Baltimore brewer’s station when I arrived and joined the queue, panting and clutching my glass. They all seemed to be asking for the Loose Cannon. I greeted the guys I’d heard about it from with a smug grin when they showed up minutes later. Yes! Beer fest training pays off once again. Two ounces of Clipper City Loose Cannon Hop3 Ale was worth the trouble. It was a complex with sweet and tart components that blended beautifully with the hop punch. I enjoyed it immensely and plan to work my way thru the rest of their Heavy Seas series when I get the chance. After checking off several more good but, sorry, unremarkable North Carolina beers I made a beeline for the All About Beer tent for the first of three presentations slated for the afternoon. 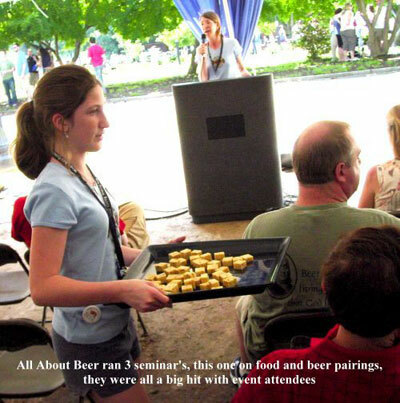 The presentations; A Lightning Tour of Classic Beer Styles, Pairing Food and Beer, and Weird Beers of the Fest, were set and hour apart. I settled into my seat and beer writer Gregg Glaser launched into his talk about different beer styles and the history behind them. That’s when a wonderful thing happened. Servers started bringing beers to me! Excellent! Here I was, comfortable… getting educated on beer…and being served a selection of great brew. I could get used to this. In fact I decided to do just that. At the end of the first presentation, which was very interesting by the way, I searched out a few select beer stations for untried beers I’ve wanted to add to my list and hustled back for the next presentation. Weird Beers of the Fest with Rick Lyke. There seemed to be a problem with accessing the chosen beers unfortunately and in the end the beers presented weren’t nearly as weird as I hoped but it was all good. The one beer that really turned my head was…and I’m sure no one will be surprised…a Dogfish Head brew. I don’t know how Sammy does it but my god he comes up with some fantastic taste bud teasers. Dogfish Head Immort Ale is brewed with organic juniper berries, vanilla & maple syrup then aged in oak and fermented with a blend of English & Belgian yeasts. My first thought was a long Ernest worthy … ewwwwwwwwwwwwwwww! Thankfully I’d already tried some before I heard the ingredients. It was, in a word, fabulous. The beer is a burnt orange in color and emitted a sweet aroma with hints of malt, juniper, and oak. The flavor was a smooth and sweet mixed with a gin-like juniper tartness that finished lightly bitter and dry. Very pleasing. This time I filled the break with a wonderful combination of North Coast Red Seal Ale and a bit of BBQ at the bandstand. The band, Guta, was a cover band that did a pretty good job of reproducing a lot of great hits from the 60’s 70’s and 80’s. The music and food put me in the perfect frame of mind for that third and final presentation, Pairing of Food and Beer by Julie Bradford, editor of All About Beer Magazine. Now, not only was I being plied with beer, but getting fed as well. Score! Julie did a great job choosing and pairing the cheese, sausage, and chocolate to world class beer. It was a perfect end to the session for me and I enjoyed and savored all of it and unfortunately I can’t remember the name of a single beer from the presentation. Sorry, what can I say, I’d been drinking for over four hours by that time and even if I could find my notes from that presentation I doubt I could read them. So suffice it to say, it was all really, really good. The World Beer Fest, created and produced by All About Beer Magazine, was one of the finest beer fests I’ve ever attended. I don’t know if it was the perfect weather, the great selection of Import and American craft brew dispensed at the optimum temperature (not a clinker in the bunch I sampled), the food, the music, the mellow happy crowd, or the interesting beer education side events that pushed my pleasure buttons. But the overall effect wrapped it up into a pleasant little package and made it a great day to share beer and cheer with friends and family. Well done All About Beer, I look forward to WBF in Durham this fall. Great story, Banjo! We’re glad you were able to attend. Sorry I couldn’t chat longer, but I was pretty busy running around trying to help keep the fest running smoothly so that people, like you, will want to continue coming back for more! Great article – you may get me to try something other than my old silver bullet stand-by. I want to see the picture of the clowns! 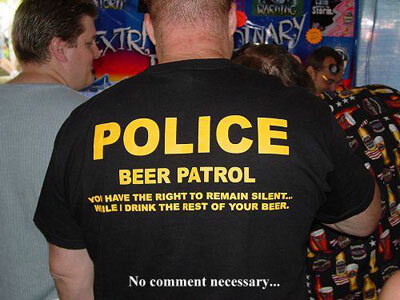 beers- its like comic relief. I have to attend a beer fest.